It was a rainy, cloudy and lightening across most of the Arizona state on July 27th. Very few people saw the bright meteor that flew over Phoenix, AZ that night. 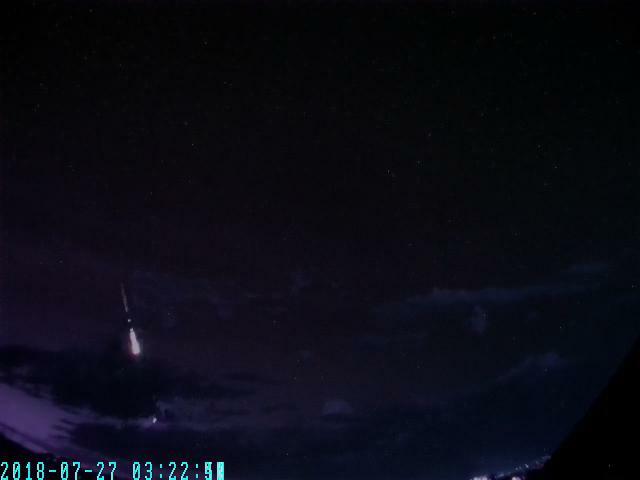 The American Meteor Society has only received 12 reports about this event – mostly from Phoenix but also from Chandler, Queen Creek, Paulden, Tucson and Peoria. One of the witness reported a sonic boom associated to the event. The event has been caught on video by the famous meteorite hunter Mike Farmer who’s now operating a camera of the AMS camera network. 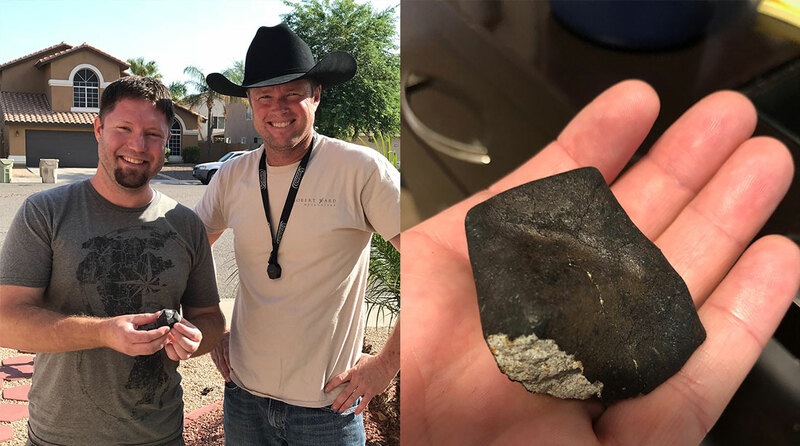 ASU professor Laurence Garvie, curator of the university’s Center for Meteorite Studies quickly confirmed it was an 85 grams ordinary chondrite – the 5th witnessed fall meteorite in Arizona. Some meteorites hunters hunted the area for few days but they have found no more pieces so far. Even though the AMS only received 12 reports about this event, the meteorite has been found less than 5 miles away from the end of the estimated trajectory computed only based on the witness reports. 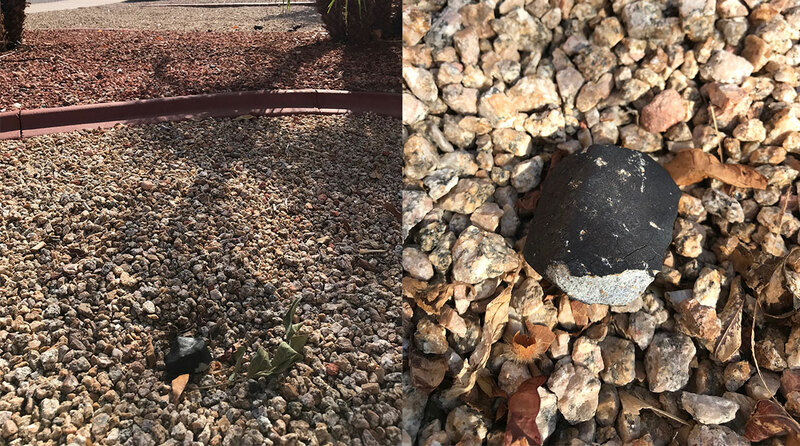 Considering the first stone was found in a dense residential neighborhood everyone on this side of Phoenix should be checking their back yards for meteorites. We live in Cave Creek AZ and saw the flash then a few seconds later felt a severe sonic boom. We actually felt lucky the windows didn’t break on the house because we could see them flex and vibrate when it hit. My daughter and her husband were at our house, and he was in the garage with the doors open when it hit. He said it felt like it was going to knock him over. We had just experienced a monsoon storm earlier that night, so there was lightning in the area which is why so many must not have realized what this was. My daughter and I knew this wasn’t lightning but couldn’t find any information about it. I’m glad to find out we aren’t crazy! It was quite the boom! A very good observing documentary. The mineral seems to be in a deep surface reaction with the carbondioxide during the fall. It would not surprise me, that this conglomerate came from an impact 100,000 years ago. I’m Jeff Wark, researcher of falls. Any info on the July 27th meteorite, please contact me at ,y email or call me at 760-432-8533 I would be interested in searching for the fragments of that Fall. Any suspicious rocks I will identify. Not sure if it’s the same one as you want but I’ve found around 15 in the desert doing my walking. I am in Gila Bend. Feel free to call me and I can send pictures. I’ve done a lot of research on meteorites and I’m pretty sure all of mine are genuine. Dear Jay could u help identify a large ‘rick’ I found ? I witnessed the one on the 27th. We were on our way back to AJ from Roosevelt Lake. The sky was very dark, then a bright light came over the mountain and lit up the whole area like an atomic bomb! I watched it shoot by my window (it seemed). It was shooting downwards and I could see a white fireball with a bright blue tail trailing behind. IT WAS AWESOME!!!! Last November 9,10 or 11th there was a meteor that hit and landed somewhere near fort Apache. Just wondering if any of those were recovered?